Continuing with the theme of Teaching English in Europe, today we are happy to share an alumni interview with Allison. Allison is currently living out her dream of living and working in Spain, and teaching abroad was her means of accomplishing that goal. At the time of this interview Allison was living just outside of Barcelona, teaching English to young children and organizing private sessions on the side. Great to hear from a participant that is making the most of her experience and loving life in Spain! And in case you missed it, don’t forget to check out our last alumni interview with Taylor in Florence. What is your background (age, previous work experience, education, etc)? Education: I majored in psychology and Spanish at UT Austin (hook ‘em horns!). Work Experience: Various restaurant jobs in high school and college (I still know some mad choreography to longs like “Love Shack” from working at Joe’s Crab Shack). Then, after graduating, I worked at a AlliantGroup, a specialty tax consulting firm. No real teaching experience to speak of. In what city/state do you currently live? Are you employed there? If so, what is your job? I currently live in Viladecans (a town about 15 minutes outside of Barcelona, Spain). I am employed in Castelldefels (another town closeby) at a Helen Doron English Academy. I teach groups of children aged 4-5, 6-7, teenagers, and adults. How did you hear about LanguageCorps? I googled “teaching English in Europe” and it was the first thing that came up. I (Ok, my parents) read up on it and it seemed legitimate so I went with it. In what country did you work? Spain… and continue to work here! So here’s my story… My mother is from Barcelona, her entire family lives here. She went to the US on a scholarship when she was in her late twenties, met my dad, and never came back. I have subsequently grown up knowing very little of my Spanish family and heritage, having only have met my grandparents and cousins only a handful of times throughout my childhood. During these encounters, communication was limited at best due to the fact that my mom hadn’t taught me Spanish and their English was rudimentary at best. Then, the summer before my senior year at UT, I decided to study abroad in Barcelona to get to know my family, work on my Spanish, have a European adventure, etc. I fell in love with the language, culture, and city, and vowed to return to live here as soon as I graduated college. I even had a job lined up with the company I had interned with. Life, however, had different plans. In that senior year, I fell in love and instead of moving to Barcelona at the end of the year like originally planned, I moved to Houston with my girlfriend, with no job prospects to speak of. This is where I found the administration job at AlliantGroup. I was soon promoted to Project Associate (actually calculating the tax credits, not just binding reports and making appointments) with no background in taxes or qualifications to speak of. This lack of experience combined with a horrendous training program and the expectation to work ungodly hours (12+ hours/day) turned me into a ball of work-related stress. Add to the mix the fact that my girlfriend and I had just broken up, and I had a recipe for a full-fledged life crisis. One day on my lunch break I took a walk, and asked myself what I would truly like to be doing. The answer was that I would like to be in Spain, as I had originally planned to do after I graduated. So when I got back to the office, I put in my 2 weeks’ notice. That night at home, I brainstormed how I could make money in Spain, especially with the current crisis. Teaching English sounded like a feasible option. I found LanguageCorps through google and sent in my application the very next week. 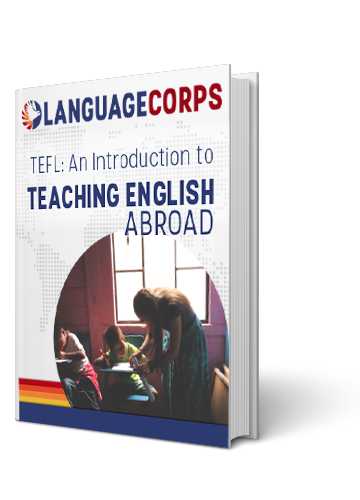 What is the most exciting thing about teaching English in Europe? For me, it has been the thrill of living in a new culture and immersing myself in it. For me, this has been much more than just a temporary adventure, I’m actually putting down roots here with the intention to stay. It’s been the doorway to a total life change for me. What was the biggest challenge you experienced? Were there any special local customs, foods, places, events, off-the-beaten-path experiences that you’d like to share? New favorite food: Angulas (like little eels). Usually cooked in lots of butter and garlic. Yum!! Had you ever done anything like this in the past (examples: Peace Corps, Teach America, etc)? Never ever. I applied to Teach for America but they turned me down…. And now I’m so glad that they did!! I’m still teaching and living happily in Viladecans with my girlfriend (whom I met here). Teaching abroad was, for me, the means to an end, that end being able to live here in Cataluña, which had been a life goal of mine for several years. Then turns out, I ended up really enjoying teaching! It’s incredibly rewarding to see my students progress. This is especially apparent with private lessons, which are my I have one student who had a very elementary level of English when she started, and very low confidence. She couldn’t string together a complete sentence in English. We’ve been working together for a few months, and the other day during class she successfully explained to me her entire weekend in English. She did it almost without realizing, and when I pointed out this success to her, she was astonished with herself. It’s moments like those that make the job so rewarding.